INFO: There's nothing quite like the unique sound of the Albee Theater's Mighty Wurlitzer − an orchestra and more all in one organ! This musical holiday event will feature theatre-organist Mark Herman (named the American Theatre Organ Society’s 2012 Organist of the Year), Cincinnati Opera Artistic Director, Evans Mirageas, as guest emcee; vocalists Jennifer Lynn Cherest and Thom Dreeze; and Nutcracker dancers from Cincinnati’s School for the Creative & Performing Arts. Experience holiday favorites performed with all of the bells, whistles, and special effects that only an instrument as grand as the Mighty Wurlitzer can create! TICKET INFORMATION – tickets on sale now! There's nothing quite like the unique sound of the Albee Theater's Mighty Wurlitzer − an orchestra and more all in one organ! Acclaimed theatre-organist Mark Herman will pull out all the stops, with Cincinnati Opera Artistic Director, Evans Mirageas, as guest emcee; vocalists Jennifer Lynn Cherest and Thom Dreeze; and Nutcracker dancers from Cincinnati’s School for the Creative & Performing Arts. This will be a nonstop concert with all of the bells, whistles, and special effects that only an instrument as grand as the Mighty Wurlitzer can create. Relive your memories of yesterday as you create new memories of tomorrow with your friends and family! "The Winter Holidays are the perfect time to enjoy the warmth of music and light, which can start and stir such wonderful memories," said Holly Brians Ragusa of The Society for the Preservation of Music Hall. 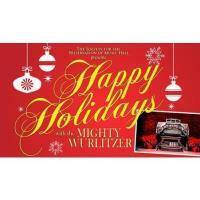 “Traditions such as our annualHappy Holidays with the Mighty Wurlitzer concert are special and help us share in the joy and peace of the Season! It'll be quite a night to discover or rediscover the Mighty Wurlitzer with loved ones in the beautiful Music Hall Ballroom. Come to remember and enjoy a sense of childhood joy and wonder." Evans Mirageas is in his 14th season as The Harry T. Wilks Artistic Director of the Cincinnati Opera. Widely considered one of the most talented and respected artistic leaders in the classical music industry today, Evans brings to Cincinnati Opera a broad range of experience in both opera and symphonic music, as well as a long history of successful partnerships with many of the world's leading singers and conductors.